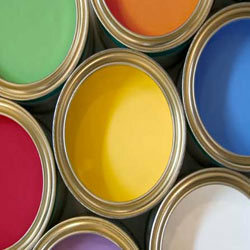 Polyurethane Paints are modern paints available today in comparison to NC (Nitro Cellulose) or Single component paints. Polyurethane paint forms a film after adding three component base, activator (hardener) & solvent thinner. Polyurethane paints after chemical curing forms a very strong film unlike a single component Paint that get dissolved by applying solvent to it. * High Resistance to Abrasion & Impact. We, “Vishal Paints”, are a well-known Manufacturer and Supplier of highly effective range of Polyurethane Paints, Epoxy Paints, Stoving Paints, Chlorinated Paints, Wood Coatings, Water Based Paints, Solvent Based Paints, Glass Coatings, Modular Office & Kitchen Furniture Coatings, Coatings for Various Plastics Surfaces, Fire Retarding Paints and Low VOC Paints, etc. Since in our inception in 1994, we run under the guidance of our Director “Mr. Arun Lanjewar”, we have achieved an indomitable position in this domain. His sharp business acumen has supported us to attain maximum client satisfaction. Located at Nagpur (Maharashtra, India), we have constructed a state-of-the-art infrastructural base. This base is systematically segregated into various departments such as procurement, production, quality testing, warehousing & packaging, sales & marketing, etc. All the segregated departments are well-equipped with requisite amenities and highly competent team of professionals. Besides, we organize important training sessions and skill development program for our professionals in order to enhance their skill and knowledge.